All it needed was a cheery ‘thanks very much, we’ll look into it’ and all would have been well but that easy-going Irish humour was lacking recently when several Ryanair staff decided having a pop at a blogger making some quite minor but nonetheless constructive, critical points about the online booking form on purveyor of cheap flights Ryanair would be the best way to represent the brand. 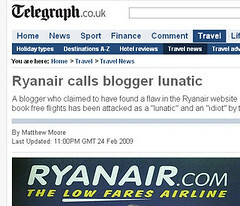 “Ryanair can confirm that a Ryanair staff member did engage in a blog discussion. It is Ryanair policy not to waste time and energy in corresponding with idiot bloggers and Ryanair can confirm that it won’t be happening again. I hate it when organisations are contrite and roll over in the face of criticism or media pressure. Why, after all, dampen down a blaze when you can stoke it up and still be wrong? It’s not as if the people you’re slagging off are, have ever been or ever will be customers. They’re just sad, lonely, sexually self-sufficient losers who never fly anywhere for £1. They (and I guess I must mean ‘we’ cos I’m writing this) just use our copious spare time being pedantic about low-cost bargain airline Ryanair and the website you might use to book bargain £1 Ryanair fares to Europe online. People like us certainly wouldn’t spend a few minutes writing a blog post about bargain airline Ryanair and linking to pages that detail this silly little affair in the hope that people looking for cheap flights to France, Germany, Italy and Spain from Gatwick, Luton, Stansted and Heathrow (to name a few!) might find those pages before the official Ryanair website. That would be a long, long, long way from the truth (almost far as the distance from the airport to the place you thought you were flying to). And I for one would never suggest that other people should do the same. There’s no such thing as bad publicity? Try telling that to Frank Bough. Just seen this .. it was up to 3 staff. The #7 was a hoax and has been removed. Good post Dan. Made me get off my arse and d the same. Not great news about cheap flights with Ryanair here. Hope you don’t mind me copying you a bit. Don’t get me wrong – I’m fully in the camp that thinks holidays are too valuable to waste on these jokers. But I do have a sneaking respect for the way they maintain there brand position, this and other ludicrous stories, like the mobile charger ban, build a clear picture of an obsessed brand in the head of the consumer. So it may not make any difference to the express reader, but I bet google research drive a lot of their traffic. A small difference in Google ranking could hurt them. they are as cheap as chips if you know what your doing, we must use them 10 times a year. I cant get the train to the airport for that price! Always amazes me to see folk complain about them when they spent more on the cab to catch the plane than they did on their flight. Take a packed lunch, get the emergency exit seats, sit back and enjoy, its cheap – end of story. And this was somehow inevitable. “smell like urineâ€ and describing them as â€œmostly stupidâ€. since when was the truth considered abuse? ?